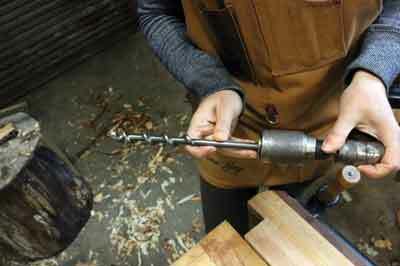 One of my first memories is using my grandfather's eggbeater drill in his workshop. I used it to 'build' all kinds of treasures while he puttered around. 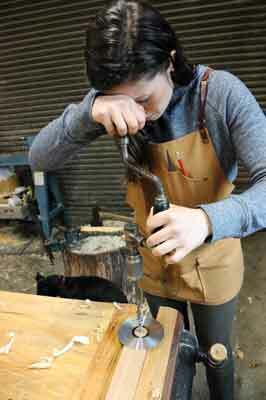 Yet another reason I love hand tool woodworking is the ability to use them to empower young woodworkers. At three years old, my grandfather put a hammer in my hands and gave me an ample supply of wood and nails. 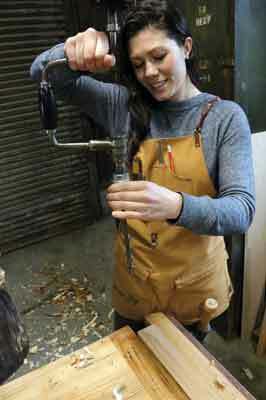 I graduated quickly to a hand saw so I could better shape the wood to the necessary dimensions for my creations. Soon small squirrel and bird houses began to take form. 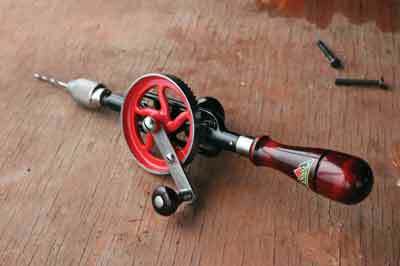 In many woodworkers' minds, the speed, ease and accuracy of electric and battery-powered drills has erased the need for a good brace and hand drill from the woodworking 'shop today. Even I grab my trusty Lithium-Ion drill far more often than I care to admit, but I'm still convinced even with the advances in technology, a good hand-powered brace and drill can never truly be replaced. 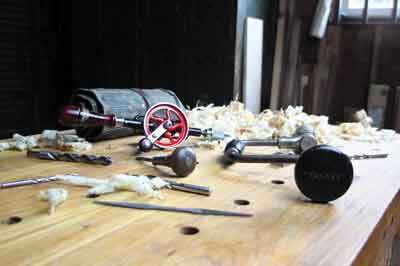 For the same arguments as using most other hand tools, the brace and drill should more than earn their keep in every tool chest: less noise, less dust and less speed - read: greater accuracy, fewer burned tips and less opportunity for error. 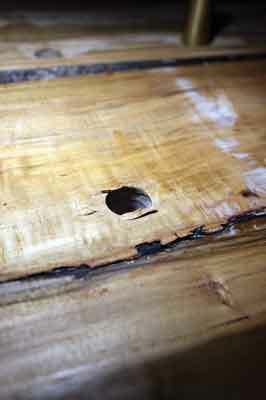 Boring holes is an absolutely essential woodworking task - whether it be as simple as pre-drilling for screws and nails, as complex as creating joinery, or excavating waste from mortises. 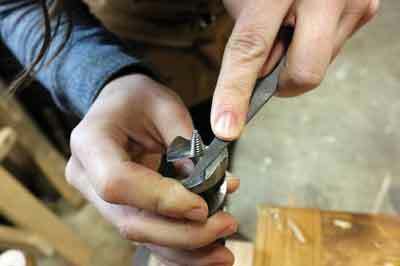 Holding the brace horizontally, open the jaws so the bit can slide in. Tighten it just enough that the bit won't fall out, but is still loose, then turn the brace vertically and tighten the chuck around the shank of the bit; this will ensure that the bit gets mounted straight and will keep you from inserting the bit too far and damaging the inside spring mechanism of the chuck. Mark the centre point of your hole with an awl. With a sharp bit mounted securely in your chuck and having taken on the proper stance, set the tip of your bit in the hole and start turning. As you drill, maintaining a straight, even line is crucial. Some people find it helpful to use two squares at 90 degrees to one another for straight holes, or two bevel gauges set at opposing angles for angled cuts. This is easiest when drilling vertically, but can also be accomplished when drilling horizontally by clamping your squares/bevel gauges to the sides of your work piece. A great tip I was recently taught is to use the reflection of a compact disc the same way you use the shiny plate of your saw to determine whether or not you are cutting straight. This works great vertically and horizontally. To keep the disc where you want it when drilling horizontally, all you need is a bit of double-sided tape. 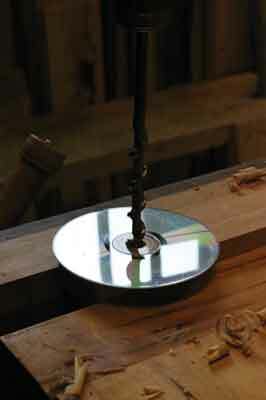 Place the CD shiny side up with the hole centred over the spot you're about to drill. Watch the reflection of the drill as you advance the bit. If the image isn't an exact mirror, you're drilling crooked. Both methods are great aids, but I recommend that you daily make a conscious effort to learn to 'see square' so the only apparatus you really need are your eyes to ensure you are always working straight and true. This will help with your sawing, will help eliminate layout mistakes and will allow you to foresee problems before they become bigger issues within your projects. Whenever mounting anything in my vice, I always take care to make sure it's sitting exactly at 90 degrees, whether it 'matters' or not. Today, if my workpiece is mounted even 3mm crooked in my end vice, I can see the error from across the workshop. To eliminate blowout when drilling holes, especially large ones, come in from both sides of your workpiece with your drill, i.e. drill nearly through one side, then flip the board and complete your hole from the other side. A good tip here is to allow the very tip of the threads of your bit to poke out, flip and use that tiny hole as the centre for your bit on the other side. Another option is to tightly clamp a scrap board to the back of your workpiece and drill past your hole and into the scrap. 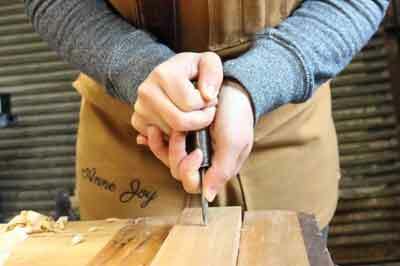 Once the threads of your bit clear the opposite side of the board, the bit will not continue to cut as it's intended and the only way through at that point is excessive force, which is the cause of blowout at the back of the cut. I met my friend Jason Thigpen through the social media site Instagram just over a year ago. He and I quickly bonded over a mutual love for woodworking and a similar sense of humour. We both ended up starting small woodworking businesses around the same time and that solidified our friendship. 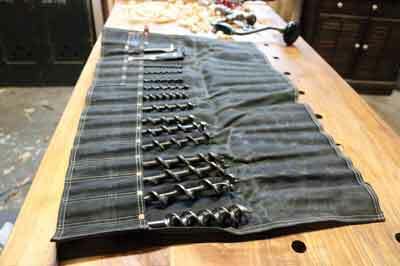 I was able to buy one of his first custom aprons and the quality and calibre of his work were such that I have resolved to acquire every subsequent product he puts out, which most recently included his auger bit rolls. The waxed canvas protects my bits from the moisture that constantly hangs in the air here in Seattle. The individual pockets prevent the bits from being jostled against one another and thus keeps the edges sharp. The pockets also help me to keep the bits organised by size so it's quick and easy to grab the one I want. One of the most precious items in the Community Toolchest is this Millers Falls No.2 eggbeater drill, which was expertly restored by Ted Hoeft of Lone Pine Toolworks. During our many email exchanges, we have discussed everything from springtime chicks to tool restoration techniques and I can tell that Ted has a heart of gold and a passion for bringing tools back to life and the artful way in which he does so is absolutely incredible. I am certain that this drill, 100 years later, is nicer than the day it left the factory. 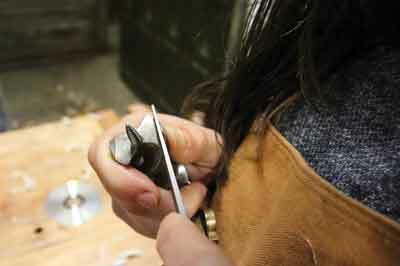 No edged tool will work unless it is properly sharpened. A bit advances not by the pressure you put on it, but by the speed at which you turn the bit. If you are needing to exert a lot of effort to advance the bit, it is likely to be dull and in need of a good sharpening. Federico, or better known to me as @mrinfla from Instagram, recently donated 22kg of various files to the Community Toolchest. Included in the package were some of the finest Italian-made iridium auger files on the market. With just a few simple strokes in the right areas, all the auger bits in the Community Toolchest were sharp and ready for service. 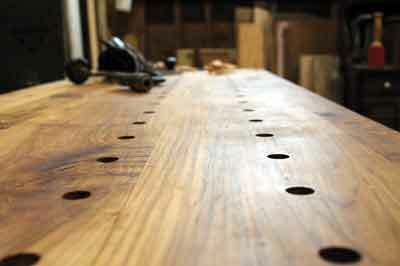 Try building a traditional bench with offset pegs and plenty of benchdog holes. After drilling over 50 of these 20mm holes by hand through my 75mm-thick benchtop and 150mm-thick legs, my drilling had much improved and I had Popeye arms for a few weeks to boot! Experiment using a series of squares and reflective objects to find the most effective method for you to drill straight, concise holes. A few well-placed squares, mirrors, or old CDs can help you build precision and muscle memory, and soon you will start to see and 'feel' square as you drill.